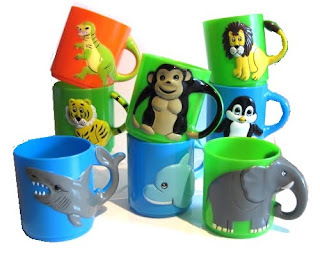 For some years now, we've carried the largest online range of animal party cups, and I'm pleased to say that following a mad rush of sales last week, we are today back to our full range of 9 different animals. Choose from our safari/zoo range (tiger, lion, monkey, elephant, giraffe), our aquatic range (dolphin, penquin, seal) and our personal favourite, the dinosaur! You can buy ready filled animal mugs, or buy your animal party cups just by themselves. Either way, they make a charming party gift for children and toddlers, and provide an affordable, useful alternative to a party bag.